The Friends of Gledhow Valley Woods are actively engaged in long term woodland management aimed at diversifying the area of woodland that exists. This diversity is not just about the variety of trees, but also about the of age structure of the trees. The ideal is to have a wide range of tree species, with a wide range of ages. This provides for the continuation of the habitat and allows more species of plant and animals to exist than in woods that have trees of the same age and type. In Gledhow, the beech trees in this location, are of a similar age and on a very steep and bare slope. Diversifying the type and variety of trees will help encourage a wider diversity of plants and animals, as well as, maintain the stability of the slope should any of these beech trees fall. Beech tend to cast a heavy shade, which prevents anything from growing beneath. The most effective way to encourage more diverse regeneration is, perhaps perversely, to remove some trees to allow light to penetrate into the woodland, allowing the establishment of other trees and plants. The felled beech trees in this location were chosen because they are at the edge of this beech woodland and adjacent to an area of more diverse woodland. The ground flora and other trees from this adjacent area have begun to regenerate into these cleared areas. Additionally the planting of oak, hazel, holly, hawthorn and other shrubs has also been undertaken to help develop further this regenerative process. Also some of the timber will left to provide dead wood for this area, another important habitat that is found elsewhere in the Valley, but very little beneath the beech wood. 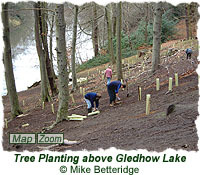 Most of the felling, planting, clearing, and other woodland management tasks are carried out on regular Action Days organised by the Friends group. There is usually one Action Day each month, and the sessions last about two hours (although people aren't expected to stay the whole time unless they want to). Anyone is welcome to attend these Action Days, and all help is gratefully appreciated. All equipment that might be needed is supplied by the Friends, including gloves, spades, rubbish bags, litter picking claws, etc.